Gilt Taste, the high-end food site operated by the Gilt Groupe, is preparing to launch a wine vertical that has some people in the industry feeling sour. According to the marketing terms that we obtained from a source, we learned that Gilt is asking wineries and other suppliers to agree to a 12-month exclusive if they choose to feature their products on the site. Gilt Taste is expected to start selling wine in August. In speaking with Gilt’s competitors, we’ve learned the terms are far from average. Seller agrees that for the Term of this Agreement, and for twelve (12) months following the Term, it will not enter into any similar agreement with a Direct Competitor or create its own flash sale site for the marketing of wine. “Direct Competitor” means a company similarly situated to Agent that is in the business of conducting online marketing via a flash sale model, including, but not limited to, Rue La La, One Kings Lane, HauteLook, Lot18, inVino and ideeli. In addition to the termination rights contained in Section 11, Agent shall have the right to terminate this Agreement immediately if Seller breaches this Section 8. Upon such termination, Agent shall have no obligation to feature a previously agreed upon Marketing Event on the Gilt Groupe Website. Based on the wording, Gilt is not specifying that a certain bottle of wine is excluded from appearing on other sites, but rather that the winery or distributor is prohibited from doing any business at all with any other flash sales sites. Despite repeated attempts to get a statement from the Gilt Groupe, it failed to provide one. UPDATE: A company spokesperson said the contract obtained by AllThingsD is an early draft, and that they are still in the process of rewriting it to include exclusivity clauses for specific products sold on Gilt Taste. No word on whether the length of the exclusivity would change. Philip James, the founder of Lot18, a membership-based wine sales site that was listed as one of Gilt’s competitors in the contract, said its policy is to ask wineries not to sell the exact same bottle (or one specific SKU) with one of its competitors for 30 days to avoid customer confusion. Another executive in the space called the exclusivity clause “very unusual.” He went on to say that Gilt does not need to require an exclusive because if the vendors are happy working with you, they’ll naturally keep coming back. 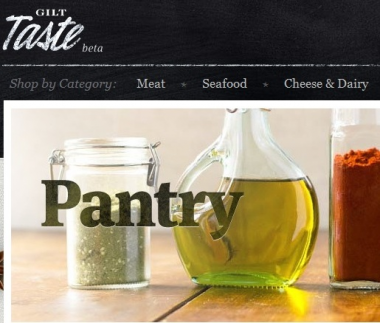 Gilt Taste is a high-end grocery service selling food and other ingredients that may ordinarily only be available to chefs, or to people living in Los Angeles or New York City. A sample of its offerings include marbled wagyu steak, dried morels, fiddlehead ferns and jumbo white asparagus. Indeed, wine is a natural pairing for the site, and clearly, this marketing agreement proves that Gilt wants to maintain the same level of exclusivity enjoyed by the produce section or seafood case. Lot18’s James said he recently became aware of Gilt’s terms after a winery sent him a copy of the contract. Lot18 has raised a total of $13.5 million in venture capital, and is banking on mail-order wine being a big business. So far, selling wine online has had a high barrier to entry because the alcohol sale laws vary state by state, making out-of-state sales complicated. Still, he’s hopeful it will become a big business, especially as state rules relax. Gilt Groupe, which recently raised $138 million, started off as a flash apparel company, but has increasingly entered into new verticals, like groceries, daily deals and full-priced men’s apparel.